The permanent members of the United Nations Security Council. The original permanent members of the United Nations Security Council in 1945 (dark blue) with their respective colonies and other holdings shown (pale blue). 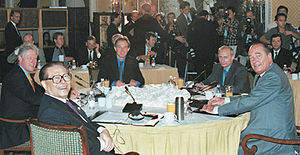 Leaders of the five permanent member states at a summit in 2000. Clockwise from front left: Chinese President Jiang Zemin, U.S. President Bill Clinton, UK Prime Minister Tony Blair, Russian President Vladimir Putin, and French President Jacques Chirac. China's seat was originally held by the Nationalist government of the Republic of China. However, it lost the Chinese Civil War and retreated to the island of Taiwan in 1949. The Communist Party won control of mainland China and established the People's Republic of China. In 1971, UN General Assembly Resolution 2758 recognised the Government of People's Republic of China as the legal representative of China in the UN, and gave it the seat on the Security Council that had been held by the Republic of China, which was expelled from the UN altogether. Both governments still officially claim one another's territory. However, only 16 states continue to officially recognise the Republic of China's sovereignty. After the dissolution of the Soviet Union in 1991, Russia was recognised as the legal successor state of the Soviet Union and maintained the latter's position on the Security Council. Additionally, France reformed its provisional government into the French Fourth Republic in 1946 and later into the French Fifth Republic in 1958, both under the leadership of Charles de Gaulle. France maintained its seat as there was no change in its international status or recognition, although many of its overseas possessions eventually became independent. The five permanent members of the Security Council were the victorious powers in World War II and have maintained the world's most powerful military forces ever since. They annually top the list of countries with the highest military expenditures; in 2011, they spent over US$1 trillion combined on defence, accounting for over 60% of global military expenditures (the U.S. alone accounting for over 40%). They are also five of the world's six largest arms exporters, along with Germany and are the only nations officially recognised as "nuclear-weapon states" under the Treaty on the Non-Proliferation of Nuclear Weapons (NPT), though there are other states known or believed to be in possession of nuclear weapons. The "power of veto" refers to the veto power wielded solely by the permanent members, enabling them to prevent the adoption of any "substantive" draft Council resolution, regardless of the level of international support for the draft. The veto does not apply to procedural votes, which is significant in that the Security Council's permanent membership can vote against a "procedural" draft resolution, without necessarily blocking its adoption by the Council. The veto is exercised when any permanent member—the so-called "P5"—casts a "negative" vote on a "substantive" draft resolution. Abstention or absence from the vote by a permanent member does not prevent a draft resolution from being adopted. There have been proposals suggesting the introduction of new permanent members. The candidates usually mentioned are Brazil, Germany, India, and Japan. They comprise the group of four countries known as the G4 nations, which mutually support one another's bids for permanent seats. This sort of reform has traditionally been opposed by the Uniting for Consensus group, which is composed primarily of nations that are regional rivals and economic competitors of the G4. The group is led by Italy and Spain (opposing Germany), Mexico, Colombia, and Argentina (opposing Brazil), Pakistan (opposing India), and South Korea (opposing Japan), in addition to Turkey, Indonesia and others. Since 1992, Italy and other council members have instead proposed semi-permanent seats or expanding the number of temporary seats. Most of the leading candidates for permanent membership are regularly elected onto the Security Council by their respective groups. Japan was elected for eleven two-year terms, Brazil for ten terms, and Germany for three terms. India has been elected to the council seven times in total, with the most recent successful bid being in 2010 after a gap of almost twenty years since 1991–92. In 2013, the P5 and G4 members of the UN Security Council accounted for eight of the world's ten largest defence budgets, according to the Stockholm International Peace Research Institute (SIPRI). ^ "The UN Security Council". unfoundation.org. United Nations Foundation. Retrieved 17 February 2017. ^ Nichols, Michelle (27 July 2012). "United Nations fails to agree landmark arms-trade treaty". NewsDaily. Reuters. Retrieved 28 July 2012. One of the reasons this month's negotiations are taking place is that the United States, the world's biggest arms trader accounting for over 40 percent of global conventional arms transfers, reversed U.S. policy on the issue after Barack Obama became president and decided in 2009 to support a treaty....The other five top arms suppliers are Britain, China, France, Germany and Russia. ^ "Countries Welcome Work Plan as Security Council Reform Process Commences New Phase | Center for UN Reform Education". CenterforUNReform.org. Retrieved 19 September 2011. ^ "Italian Model" (PDF). Global Policy Forum. 2005. Archived from the original (PDF) on 19 May 2009.